For the Sega Dreamcast accessory also known as the "Racing Controller", see Race Controller. 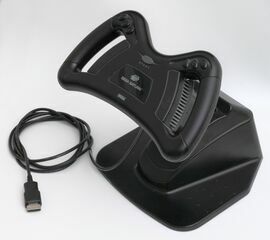 The Arcade Racer Joystick, called the Racing Controller (レーシングコントローラー) in Japan, is a racing wheel style controller for the Sega Saturn. As opposed to many digital controllers at the time, the Arcade Racer is analog in nature, allowing for smoother control than a standard Sega Saturn D-Pad. Whereas digital controllers rely on values assigned to on/off switches (like light switches, they react in steps), analog controllers respond in a smoother arc (like dimmer switches). The Arcade Racer was designed primarily for racing games such as Virtua Racing, Daytona USA or Sega Rally Championship. Its height and angle can be adjusted by the user. The seven face buttons are positioned on the face of the wheel, and the and directions are redesigned into paddles on each side of the wheel which resemble semi-automatic transmission paddle shifters (or a "flappy paddle gearbox"). These paddles are digital, not analog, unlike the wheel itself. The Arcade Racer does not have or buttons, so games designed for it cannot use those buttons. The Arcade Racer is supported by most driving games released for the Sega Saturn (in North America it was mandatory that racing games supported the peripheralMedia:DevelopMental US 0309.pdf). There are a few, such as Impact Racing or Road Rash, that do not support it, however, perhaps because they need the additional buttons that the Arcade Racer is missing. Most games that do support the Arcade Racer will also work in analog mode on the Mission Stick and 3D Control Pad, but a few, including Virtua Racing and Hang-On GP, require the Arcade Racer for analog play. From a design perspective, the Arcade Racer Joystick is one of the oldest Saturn controllers, so much so that it originally started life as a Sega Mega Drive wheel. Known as the Sega Wheel it was originally set to debut with Virtua Racing in late 1994, but in the end no official wheels were released for Sega's earlier console. Main article: Arcade Racer Joystick/Magazine articles.